The only countries invited were the eight that voted against the resolution and the 35 that abstained. U.S. allies, including most of the European Union, were left out. She later posted pictures of the gathering on her Instagram account, and lashed out at the U.N.
Ms. Haley, in her nearly two years at the U.N., juggled multiple roles as one of the most visible faces of the Trump administration’s foreign policy. She was an administration representative who advocated for often controversial White House policies and its “America First” outlook. She was a diplomat who reached out to counterparts. And she was an American political figure who racked up national and international exposure and experience that would be useful for future opportunities. On Tuesday, Ms. Haley made the surprise announcement that she was resigning from her position at the end of the year. Mr. Trump praised her for shaping the U.N. ambassadorship into a glamorous job. Ms. Haley engaged in intense backroom diplomacy with both allies and adversaries, including Russia and China. She found success on issues including sanctions against North Korea and an arms embargo against South Sudan, as well as failure to redress Syrian chemical-weapons use and to win converts to the administration’s view of the Iran nuclear deal. In dealing with both diplomats and with U.N. Secretary General António Guterres, she gained recognition as an effective interlocutor between Washington and the world body. Some international officials, though, thought Ms. Haley’s confrontational diplomacy mirrored the posture of her boss, such as demanding agreement with U.S. positions and attacking opposing views. Many previous U.N. ambassadors have been presidential advisers who closely mirror the views and tone of their boss, including Ms. Haley’s predecessor, Samantha Power. Some have been deeply involved in politics, either before or after their tenure at the U.N., such as former New Mexico Gov. Bill Richardson, who served in the U.N. post under President Bill Clinton. However, few if any have come to the job with no previous foreign-policy experience, or have been so widely considered a potential future presidential candidate, as many see Ms. Haley. France’s Ambassador François Delattre said Ms. Haley had “exceptional political instincts and skills” and tried to shake up the U.N. bureaucracy by pushing everyone to break out of comfort zones. “Typically, in a meeting, she would avoid endless platitudes and put the finger right away on the two key questions that nobody wanted to address,” said Mr. Delattre, who knew Ms. Haley prior to her posting at the U.N. He was France’s Ambassador to Washington when she was governor of South Carolina. 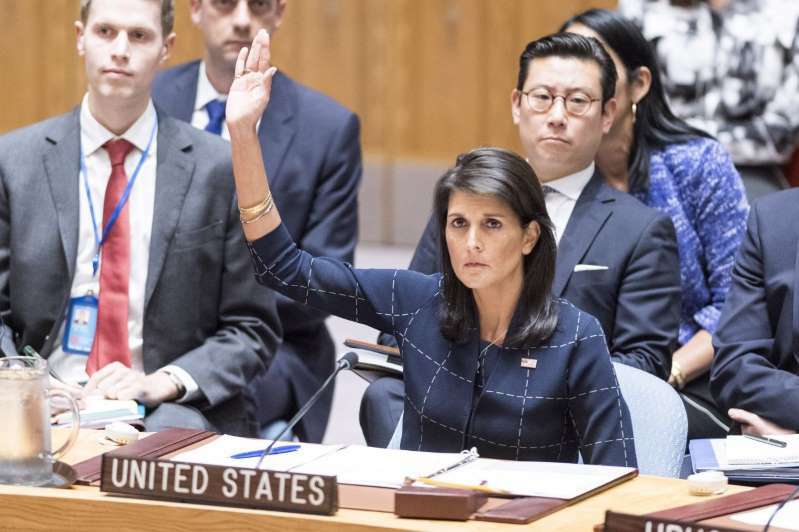 Ms. Haley’s most notable accomplishment in diplomacy was convincing Russia and China to endorse Security Council resolutions imposing tough economic sanctions on North Korea and an arms embargo on South Sudan. Many experts contend that sanctions played a significant role in convincing Pyongyang to negotiate dismantling its nuclear and ballistic-missile programs. She was willing to part ways from Mr. Trump, calling out Russia for being an accomplice to Syria’s bloody war and denouncing its claims to Crimea. Russia, for its part, repeatedly blocked Ms. Haley’s attempts to pass resolutions to hold Syria’s government accountable for using chemical weapons. Her positions on Israeli-Palestinian issues and on Iran invited the most criticism and at times isolated the U.S. Ms. Haley identified both issues -- defending Israel against what she called “bias” at the U.N. and criticizing Iran on human rights and regional policy -- as priorities. Human-rights organizations said that her advocacy for rights in Iran, Nicaragua and Venezuela was undermined by her decision to withdraw the U.S. from the U.N.’s Human Rights Council in June. Ms. Haley cited a lack of effort at reform and bias against Israel as reasons for abandoning the organization. “She cherry-picked [human-rights violations] and often focused on issues where the U.S. has questionable intentions,” said Louis Charbonneau, U.N. Director for Human Rights Watch. She joined with Mr. Guterres in tandem efforts at restructuring the U.N.’s operations and its funding. Yet Ms. Haley’s time coincided with unprecedented U.S. disengagement from the U.N. on multiple fronts. Washington withdrew from international agreements such as the Paris Climate deal, the Global Compact for migration and the Iran nuclear deal, and pulled out of the U.N.’s Human Rights Council and Unesco, the world body’s educational and scientific organization. The U.S. also ended its funding for U.N. Relief and Works Agency, its fund for Palestinian refugee aid. While Ms. Haley hasn’t specified her reasons for leaving, she gave Mr. Trump her notice last spring, the president said, when he named Mike Pompeo as secretary of state -- a job for which she had been considered a candidate. While she said she won’t run for public office in 2020, friends and rivals at the U.N. said that they expect to see Ms. Haley back on the national political stage in the future.